Chapter 11 of the overlong response by Mattogno, Graf and Kues (MGK)  to our critique of some of their books was written by Carlo Mattogno and addresses chapter 7 of the critique, which deals with the mass graves at the Aktion Reinhard(t) camps and at Chełmno extermination camp. Addressing the section headed "Number, Dimensions and Contents of the Mass Graves", on the first page of this chapter (1193), Mattogno remarks (regarding my quote, after his book about Bełżec extermination camp, of reports by an investigative judge and a coroner dated, respectively, 12 and 13 October 1945) that I "should at least take notice" of his having been "the first (at least in the Western literature) to quote from this document". If Mattogno expected kudus on top of my clear reference to his publication, I’ll be glad to satisfy his vanity by telling him that I’m grateful for the contribution to historiography that he made (to the detriment of "Revisionism") by quoting from the document in question. This is one of several accusations, amusing on account of their instructive silliness, that I "plagiarized" the work of one or more of the three authors or failed to give them due credit. Thus on the next page Mattogno takes issue with my having stated that coroner Dr. Mieczyslaw Pietraszkiewicz’s opinion following his report about human remains examined was not quoted in Mattogno’s book, complaining that "readers could thus easily get the impression that I kept silent about this document". The period at the end of footnote 5 on page 384 seems to have escaped Mattogno’s attention. A similar accusation is found on page 1201, where Mattogno claims that the "Aktion Reinhard Camps" website "clearly" got a map of Treblinka from Mattogno & Graf’s book about that camp, which I’m supposed to have known or noticed but not mentioned. "On pp. 390-391 Muehlenkamp quotes the translation of the part of Prof. Kola’s archeological survey in Sobibór about the mass graves.2680 We were the first to retrieve the Polish text of Kola’s article, translate it and analyze it; the passage quoted by Muehlenkamp has already been quoted by us,2681 and he knew it well, but he preferred to ignore it in deference to the plagiarist bloggers’s tale about our alleged meager documentation." With all due respect for Mattogno’s inflated ego, MGK’s Sobibór book was published in May 2010. I received a copy of Prof. Kola’s Sobibór report from Yoram Haimi and published a translation of the mass graves’ description, as well as two maps from that article, on 27 October 2008. The complete translation of Prof. Kola’s report about the archaeological survey in Sobibór was published on 18 May 2010. What other sins am I supposed to have committed? Well, on page 1196 I’m accused of having given an example of my "method of deception" by invoking a testimony from Treblinka, namely that of Oscar Strawczyinski, to support what I consider a plausible explanation of why the Bełżec mass graves were not completely emptied of corpses. It’s hard to understand what is supposed to be deceptive about my argument as I expressly mentioned that Strawczyinski’s testimony referred to Treblinka, and Mattogno doesn’t explain. Against my argument that – like at Treblinka, according to Strawczyinski – the SS at Bełżec may have simply found it too difficult to extract some corpses from the bottom of the mass graves, Mattogno brings up the testimony of Wiernik whereby up to a certain time 75 per cent of the corpses in the mass graves had been cremated and work was begun to empty the remaining 25 per cent of the graves. Apparently this is supposed to be a categorical statement by the witness that every last corpse was removed from the graves, in Mattogno’s understanding. Capitalizing on Wiernik’s mention of the excavator’s capacity, which is obviously impossible if one reads the witness’s description the way Mattogno likes to do, Mattogno claims (without substantiating his claim) that it "doesn’t make any sense" that blood mixed with water accumulating at the graves’ bottom prevented their being entirely emptied, as recalled by Strawczyinski. On page 1199 I’m accused of "the misrepresentation of our statements, which are neither quoted nor is the page indicated where one can find them, for obvious reasons". Mattogno seems to be taking issue with my remark that "Mattogno & Graf claimed that Łukaszkiewicz' investigations had failed to produce evidence of mass murder", and to prove the alleged misrepresentation he quotes a long slab of text from pp. 89f. of his Treblinka book’s English version, which starts with the period "Even the investigations performed by Łukaszkiewicz proved to be a complete failure in terms of this central question." (i.e. the question of "physical evidence" and of "corpora delicti", as Mattogno clarifies) and ends with the period "Nothing produced even the trace of evidence for a mass murder, to say nothing of such a crime committed against several hundred thousand people." So Mattogno and Graf had claimed exactly what I wrote they had claimed, namely that Łukaszkiewicz' investigations had failed to produce evidence of mass murder. On page 1200, I’m accused of having "for obvious reasons" omitted, from a Polish press article about the Treblinka "gold rush", the introductory remark before my quote of Karol Ogrodowczyk’s postwar description of the Treblinka site and robbery digging there. Apparently the "obvious" reason why I omitted this is that it refers to the Soviets as being the or among the robbery diggers – a rather silly suspicion considering that I expressly mentioned robbery digging by the Soviets later in the chapter. Besides accusations of wrongdoing, Mattogno’s assessment of the section headed "Number, Dimensions and Contents of the Mass Graves" focuses on arguing that the physical remains described and partially photographed by investigators are insignificant if set against the magnitude of the "alleged" crimes. On page 1194 he asks whether "these bone remains" (meaning the ones described in Judge Czeslaw Godzieszewski’s report of 12 October 1945 and coroner Mieczyslaw Pietraszkiewicz’s report of 13 October 1945)  "prove the killing of 435,000 people". That’s a silly question. No, Mr. Mattogno, they don’t prove that killing all by themselves, and no historian would expect them to. But these "bone remains" are a significant part of the evidence to mass murder at Bełżec extermination camp, insofar as they suggest a very large quantity of human bodies (as was pointed out by coroner Pietraszkiewicz) and are thus compatible with what becomes apparent from other evidence regarding that mass killing. Obviously aware of this inconvenient fact, Mattogno calls in question the accuracy of the investigators' descriptions, based on one of two photos included for illustration purposes in the critique’s chapter 7. These images – one shows a small hole dug by robbery diggers, the other I had referred to as possibly showing some of the remains examined by the Polish coroner – Mattogno sees as "confirmation of his doubts about the real amount of the human remains actually found" (pp. 1194-95). Thus we see Mattogno indulging in quote-mining, as he omits the "possibly" in my reference to image 7.2 (which might as well not be related to coroner Pietraszkiewicz’ report at all). We also see him displaying fallacious reasoning, to be polite. For we don’t know how many photographs of the remains described in the quoted reports were taken and where they were published if at all, and what photographs were taken were obviously meant for nothing other than illustrating the finds described by showing a few of them, already because photographs can, due to the limitations of the camera eye, show but small parts of large scenes. Finally, we see him spinning a conspiracy theory, baselessly accusing the investigators of having provided false information in the quoted reports. Two pictures featured by Mattogno himself, taken in Bełżec on an unknown date, are supposed to "fully confirm the ridiculously small magnitude of the human bones found there" (p. 1195). Outside Mattogno’s fantasies, all these pictures suggest is that someone incidentally found some larger bones on the Bełżec site at some time (which may have been decades after the investigations in November 1945, for all we know) and pictures of these larger bones were taken. Also as concerns Treblinka, Mattogno claims that the "material proofs" are "absolutely insignificant compared to an alleged extermination of 789,000 persons" (p. 1201). Does that also go for the depth of the pits established on hand of one sample (7.5 meters) and the size (about 2 hectares) of the area covered by human remains? Mattogno would have a point if the physical evidence contradicted what becomes apparent from eyewitness and documentary evidence. But that is not the case. As he comments the illustrations included in chapter 7, Mattogno shows his keen eye by seeing "only shapeless piles of soil" in images 7.7 and 7.8 (the bones or bone fragments seen as brighter objects in the soil obviously escaped his attention), and his utter incomprehension of the purpose and limitations of ground photography (which was obviously meant only to provide exemplificative illustrations of what is described in site investigation reports) by gleefully remarking that the photographs shown must be the best I "could find relating to this topic". An instructive exercise for Mattogno would be to collect all published photographs showing people killed one way or the other during World War II and then tell his readers what percentage of the conflict’s victims can be seen on all these pictures together. Maybe then he will understand how fallacious it is to draw quantitative conclusions from photographs. 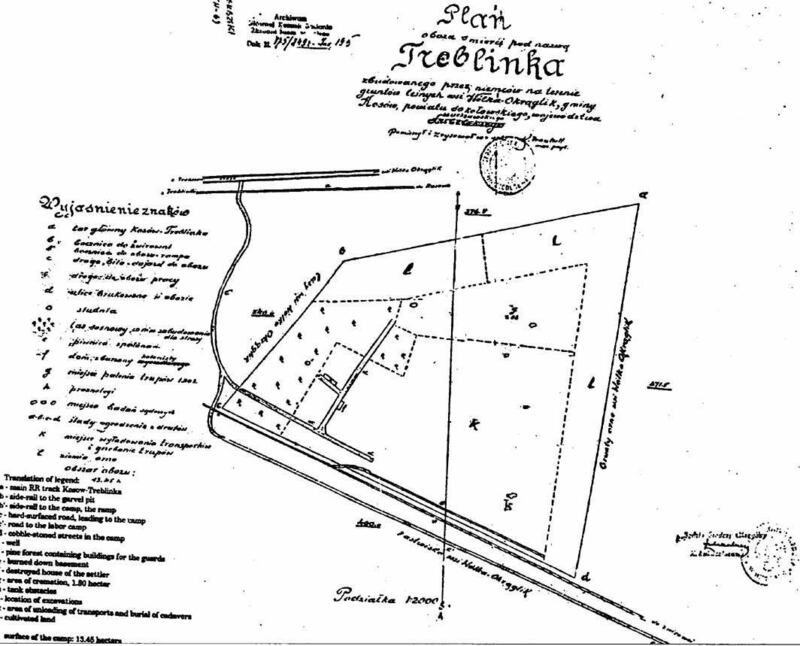 Mattogno takes issue with my pointing out an area called the "area of cremation" in the Treblinka map I supposedly "plagiarized" from a site that allegedly "plagiarized" it from his Treblinka book (p. 1202), asking what the "site of the cremation of the corpses" has got to do with the area of burial. The answer is that it must be the same area unless the corpses were taken to another area to be burned, which is highly unlikely and not borne out by the evidence. Mattogno should think before writing. And read, as this might have kept him from making a fool of himself by lecturing (p. 1203) that the area in which Peter Laponder made out what he considered pits for corpses used during the first phase of Treblinka was not the "area of cremation" – after I had expressly mentioned that the mass graves identified by Laponder were in the camp’s former "reception" area/sorting yard. After pointing out (quite unnecessarily) that these mass graves "probably contained only the corpses of those deportees who had arrived dead in the camp", Mattogno considers it pertinent to remark that although the number of deportees dead on arrival had to be much smaller than that of those "allegedly" gassed, "the area in which they are found is not much smaller than the 'death camp proper'". Someone should remind Mattogno of the fact that the "reception camp" area served a number of purposes other than burial, e.g. it contained the warehouses where the plunder taken from the victims was kept. It’s size, according to Sergey Romanov’s measurements on Peter Laponder’s map, was 19,930 m², vs. 41,390 m² for the "death camp" sector. Regarding the 4 mass graves at Chełmno investigated by archaeologist Łucja Pawlicka-Nowak, Mattogno (p. 1203) takes issue with my remark that a correction factor to take account of volume loss from sloped walls, as was applied regarding the mass graves of Sobibór, is not necessary due to the low depth of the graves. He invokes the witness "Szlamek", according to whom a grave "had the section of an upside-down trapezoid, with the smaller base on the bottom at 1,5 m depth and the bigger base at the top of 5 m". "Szlamek", as Mattogno informs his readers on p. 52 of his Chełmno book’s English translation, worked at Chełmno from 6 January 1942 until the date of his escape on 19 January. The small and rudimentary graves described by this witness were hardly the same as the very long graves identified by archaeologists, into which corpses hurriedly buried in the early weeks of the camp’s operation may have been later transferred. Before moving on to the next section of chapter 7, Mattogno accuses me of having basically ignored an earlier refutation paper he sent my way. This accusation is quite astounding as I dissected said paper in a series of articles on the HC blog site, moreover as Mattogno responded to the first two installments of the series and the same is referred to on several occasions in the Critique. The "Extermination Camps" of "Aktion Reinhardt" An Analysis and Refutation of Factitious “Evidence,” Deceptions and Flawed Argumentation of the "Holocaust Controversies" Bloggers, 2013 Castle Hill Publishers, UK, online under [link], hereinafter "Extermination Camps". Jonathan Harrison, Roberto Muehlenkamp, Jason Myers, Sergey Romanov, Nicholas Terry, Belzec, Sobibor, Treblinka. Holocaust Denial and Operation Reinhard. A Critique of the Falsehoods of Mattogno, Graf and Kues, A Holocaust Controversies White Paper, First Edition, December 2011, online i.a. under [link] and [link], hereinafter "Critique". Carlo Mattogno, Bełżec. Propaganda, Zeugenaussagen, archäologische Untersuchungen, historische Fakten, Castle Hill Publishers, Hastings 2004. English version: Bełżec in Propaganda, Testimonies, Archeological Research and History, Theses & Dissertation Press, Chicago 2004, online under [link]. The English version is hereinafter cited as "Mattogno, Bełżec". "For the German translations from Polish of the excavation protocol dd. 12 October 1945 and coroner Dr. Mieczyslaw Pietraszkiewicz’s report and opinion of 13 October 1945, which were partially transcribed and translated by Mattogno, see BAL B162/208 AR-Z 252/59, Bd. VI, f. 1121 ff." 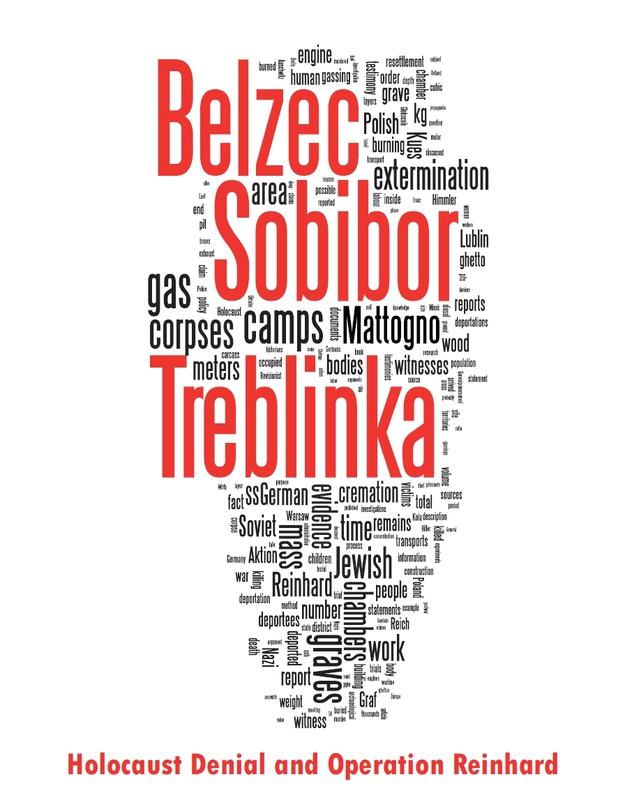 [link], page "Mapping Treblinka" - [link]. [link], shown as Image 7.11 in Critique, p. 397. Carlo Mattogno and Jürgen Graf, Treblinka – Vernichtungslager oder Durchgangslager?, Castle Hill Publishers, Hastings 2002. 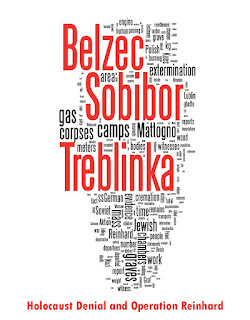 English version: Treblinka – Extermination Camp or Transit Camp, Theses & Dissertation Press, Chicago 2003. Online: [link]. Carlo Mattogno, Jürgen Graf, Thomas Kues, Sobibór: Holocaust Propaganda and Reality, 2010 The Barnes Review, Washington D.C. Online: [link]. Blog article "Mass Graves at Sobibor – 10th Update" ([link]). Quoted, mostly after Mattogno’s Bełżec book, on pp. 383-385 of the Critique. Quoted in Critique, pp. 384f., after BAL B162/208 AR-Z 252/59, Bd. VI, f. 1124. Images 7.1 and 7.2 on p. 386. Critique, images 7.7 and 7.8 on page 396, 7.9 and 7.10 on page 397. Critique, image 7.11 on page 397. Image 7.13 on page 399. Which was part of Treblinka’s "death camp" sector. Critique, Image 7.15 on page 424. As demonstrated later in the critique, burying the Jews murdered at Treblinka in 1942 would have required a burial area of less than 9,000 m². Carlo Mattogno, Chełmno. A German Camp in History and Propaganda, The Barnes Review, November 2011. Łucja Pawlicka-Nowak, "Archaeological Research in the Grounds of the Chełmno-on-Ner Former Extermination Center", in: Pawlicka-Nowak et al (editors), Chełmno Witnesses Speak, The Council for the Protection of Memory of Combat and Martyrdom in Warsaw and The District Museum in Konin, 2004. Plans No. 5 and No. 6 show the mass graves in Plot III and Plot IV, and an aerial photo of the latter is also included in the article, which can be read under [link]. "Belzec or the Holocaust Controversy of Roberto Muehlenkamp" ([link]). My responses to Mattogno’s objections are in the articles "Belzec Mass Graves and Archaeology – Continuation" ([link]), "Belzec Mass Graves and Archaeology - Continuation (1)" ([link]) and "Belzec Mass Graves and Archaeology - Continuation (2)" ([link]). ""Aktion Reinhard Camps" website "clearly" got a map of Treblinka from Mattogno & Graf’s book"
So the idiot accuses the website of plagiarism on one hand, relies on it (or rather on Carmelo Lisciotto's vandalism of it) to smear us. Fraud is as fraud does. I don't have any pictures of Carlo Mattogno. Maybe he doesn't exist, either. Nathan, fortunately (or unfortunately) Mattogno exits (finally, this "Rev" is real... lol), put his name on Google images it appears the picture of this "carcamano" (some "Revs" haven't "appreciated" this word at Rodoh, hahahaha). Roberto, I googled Mattogno in google images like you suggested. It only has pictures of "him" as an adult. No child or school photos. "Material Proof" fails to suggest that this individual exists, had a normal upbringing or any education. Is Mattogno retarded? some of that stuff could easily be mistaken for Gerdes or Hannover scribbling. "the mighty BLOB", yeah right. My challenge to the media: "Show me or draw me Carlo Mattagno!" This is off topic but the deniers have lost one of their own. Bradley Smith apparently passed away yesterday. Did any of you have any dealings with him? I had quite a few. Maybe I'll write something. Samuel Willinberg passed away yesterday as well. May he rest in peace. I've always admired the men and women who revolted at Sobibor and Treblinka. Granted, it was a desperation move but it did take courage to take that step. It is sad that we've lost those survivors. I hope they've found the peace they deserve, no more nightmares. "Roberto, I googled Mattogno in google images like you suggested. It only has pictures of "him" as an adult. No child or school photos. "Material Proof" fails to suggest that this individual exists, had a normal upbringing or any education." Graf too (link) speaking in Italian (I haven't known he speaks Italian, big surprise). Well, only deniers interview other deniers. Nobody else cares about them. Il Cappo de tutti Nazi. He comes across as barely literate tbh. Q Were you assigned to any other duties in Camp Two, other than carrying bodies? A After they had emptied out the pits of bodies, dead bodies, I was assigned to, with my bare hands, to scrape out of there the remains of the dead - of bones. Pieces of flesh. Q Out of the pits? THE INTERPRETER: Excuse me one moment. A To clarify and continue, while we were scrapping up the bones at the bottom of the pit, the crane sent down a basket that we put the remains in, and lifted it out. I would say in the area of a week or so for each of the various pits. And: What I am referring to is a week of the final clean-out of the pits by hand, using my hands. Fedorenko's de-naturalisation hearing is cited in the Manifesto [p.85 n.213], so why did you hide this information that contradicts your claim the Treblinka pits were only partially cleared? Muehlenkamp ignores the statements of upper camp witnesses such as Pinchas Epstein, who claimed to have been personally involved in the cleaning out of the last, small, remains (bone fragments and the like) from the bottom of the Treblinka pits. Furthermore, I fail to see the relevance of these testimonies as the section of the BLOB smasher in question refers to Belzec, not Treblinka. And Macuntgno's arguments on the presence of some corpse materiel in the Belzec mass graves were so hilariously impotent that they refute themselves. Jeff, please moderate your language. The man's name is Mattogno, etc. Your wishful thinking on what documents that you've never seen actually state never ceases to cause amusement. Epstein worked on clearing the pits up until the uprising in which he and Strawczyinski escaped. So it's not "very possible" Strawczyinski was describing a "pit" [singular] that "fell later in the schedule". "The graves could never be emptied entirely, because blood mixed with water accumulated at the bottom. Motorized pumps were set up to draw it out. However, they could never manage to drain the bottom few meters, and so the graves were simply covered over." It's a wonder how Epstein didn't drown in this metres deep blood-water at the bottom of each pit (a blood-water that he himself never mentioned). Q: [... Y]ou worked primarily in emptying the pits during that period? A: Yes, when they dug deeper into the pit, and the excavator could no longer gather the corpses and the Germans did not want to leave any remains — I and another person were put down in the pits and with our hands we had to gather up the bones, we had to fill a kind of basket — it would be lifted up — and emptied out and we would repeat this over and over again. 1. Epstein was right, all pits at Treblinka were cleared out unlike pits at Belzec and Sobibór, which were not completely cleared out for unknown reasons (Treblinka being the last camp where the mass graves were cleared out, the SS may have been more thorough there than they had been at the other two camps, where they had removed corpses only as deep as the excavator could go). 2. Strawczyinski was right, the pits at Treblinka were not completely cleared out. Possibility 1 can be considered the likelier one as Epstein worked in the death camp whereas Strawczyinski did not. The rabbit's accepting Epstein's testimony regarding the clearing out of the mass graves as accurate means that the rabbit accepts that testimony (which I presume was not just about clearing out the graves) as proof of mass murder at Treblinka, unless the rabbit can provide a good reason why Epstein's testimony should have been accurate only as concerns the clearing out of the mass graves but inaccurate as concerns the reason why these mass graves existed in the first place. My apologies for forgetting this one to Mr. Jansson, who I had promised to duly credit in footnotes for his valuable contributions to my response to Mattogno. I'll console him when I get to the capacity of the mass graves, where his contributions will be duly acknowledged. Jansson’s Epstein argument was addressed here, without the benefit of your quotes. With those I would have argued as I do now. Epstein’s testimony shows that the SS at Treblinka (apparently unlike at the other two camps) made an effort to wholly clear out the mass graves. Whether they were wholly successful in this endeavor is another question. Physical evidence dug up by grave robbers and criminal investigators included whole bones and skulls, even tissue, suggesting corpses left at the bottom of some mass graves, the incompleteness of cremation, or both. The daft rabbit ignores the possibility that both witnesses may be recalling elements of the truth. I.e that most of the graves were cleared out, but that a few were only 90% cleared due to environmental difficulties. That is the impression gathered from the evidence seen in Polish investigations of robbery digging. There is no indication that Epstein's efforts were 100% successful in every grave, and nothing he said precludes the likelihood (or in this case the certainty) of a number of partially decomposed corpses remaining at the bottom of some of the graves. I actually value Strawczyinski's testimony more than Epstein's, namely because it was given at a earlier date and with a less significant elapse of time. And you failed to acres my knockout blow to your argument: that this is irrelevant because we are discussing human remains found in Belzec, not Treblinka.